Of all the functions and devices technology promises to improve or replace, there are few more critical to you and yours than the lock on the front door to your home. Like most technology, however, so-called "smart" locks represent two steps forward and one step back for your home security. The metaphorical two steps forward actually encompass several advancements. Instead of fumbling for keys while your arms are full of groceries, you can unlock your door via keypad or just by approaching it. You can track who enters or exits your home and when. You can assign timed "guest" keys or PIN codes for temporary visitors, such as family or friends staying for a few days or service workers who only need entry for a few minutes or hours. But smart locks present one giant step back: Now you have to think about your lock. You have to conduct a 15–30-minute DIY installation, usually requiring only a screwdriver but best suited to the more mechanically-inclined members of your household. You have to learn how your new gadget and smart lock app work. You have to deal with potential — maybe eventual — wireless unlocking/locking unreliability. And you have to worry about something you never had to be concerned with regarding your lock before — battery life — possibly arriving home with a dead smartphone or to a dead smart lock. As unlikely as most of these possibilities are, they're still factors that had hitherto never been a concern. Fortunately, there's a plethora of smart locks offering a variety of technologies and features that address or alleviate these steps backward, and you should be able to find options that suit your specific home security situations and needs. Smart locks divide into two distinct categories: those that would completely replace your current in-door bolt lock (not add-on, back-of-the-door latch bolt locks) — which add new, usually bulky and obvious, devices to the front and rear of your door — or, retrofit smart locks that simply replace or are installed on top of the thumb-turn cylinder on the rear, inside of your door, leaving the existing key lock on the front of your door untouched. Generally speaking, replacement smart locks provide far more entry options — and advertise to everyone, nefarious or not, for good or not, that you have a smart lock. 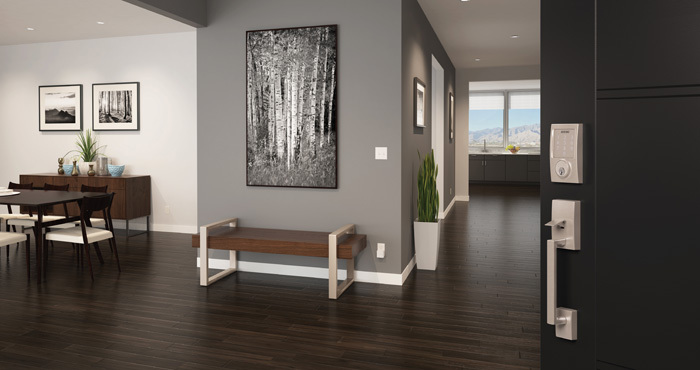 Retrofit smart locks offer simpler installation and usage solutions with most of the steps forward and fewer of the steps back, with no outward clue to visitors that a smart lock is installed. 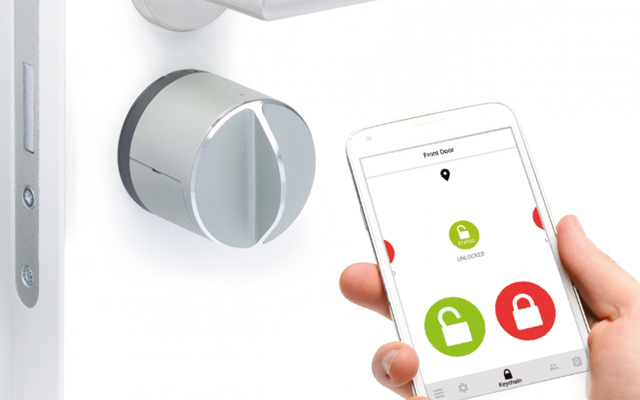 To be defined as a smart lock, as far as this overview is concerned, a lock has to include, out of the box, Bluetooth for local wireless entry and/or Wi-Fi for away-from-home remote control/lock/unlock capabilities, and an app to provide keyless or even keypad-less unlocking and locking. There are a handful of more-or-less traditional locks that provide "smart" and wireless connectivity only via an external adapter; another handful of smart locks include Bluetooth for in-person unlocking but require an adapter to add Wi-Fi for remote operation. Most smart locks operate on either multiple AA alkaline batteries or a rechargeable lithium-ion cell. In both cases, you'll get an alert on your app when battery power gets low, and the housing mounted on the inside of your door will often include an LED that will flash red when the battery needs to be replaced/recharged. Many companies rate their battery life in terms of the number of "cycles" — the number of physical locks and unlocks — and power usually lasts anywhere from three months to a year, depending on the type of lock and the functions it performs. Even tech-centric companies realize that you can't rely only on often-unpredictable Bluetooth or Wi-Fi to unlock your smart lock. 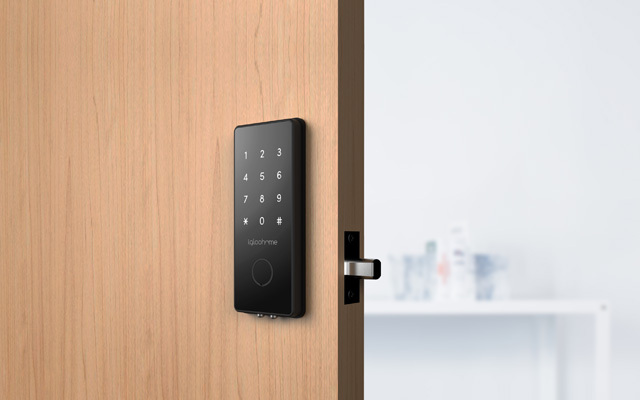 Aside from wireless unlocking techniques, more realistically-designed smart locks offer alternative physical or electronic entry options, including PIN codes (sometimes with an add-on keypad, also Bluetooth-connected) and/or a physical key. A small number of smart lock suppliers also offer a key fob to wirelessly unlock a door if you don't have your smartphone with you. 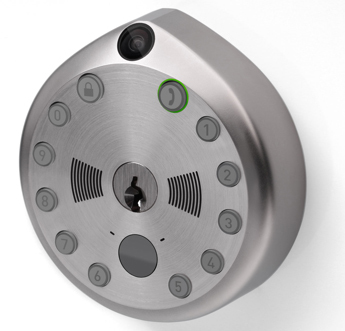 Bluetooth-enabled locks usually provide keyless/PIN-less entry. When your phone is on your person, a smart lock — especially a retrofit lock — may let you auto-unlock your door when you are a user-prescribed distance away (within 30 feet, and only from the outside), and auto-lock behind you after a user-prescribed period of time. Smart locks with keypads usually don't include proximity auto-unlock capabilities for security reasons, such as preventing an intruder from entering by using your lost or stolen phone. Smart locks, especially retrofit models, let you assign "keys" for visitors you allow to enter your home — out-of-town friends or family members, service workers or delivery people, neighbors to water the plants or feed the cat while you're away, Airbnb clients, etc. You text or email a code (they likely also will need to download the smart lock app) that gives your visitor wireless entry capabilities for a prescribed period of time or a prescribed number of entries. Replacement smart locks with keypads allow you to simply assign temporary PIN codes, timed for single use or for a specific number of hours or days. Most smart locks also track who comes and goes, and smart locks with Wi-Fi can send an alert to your phone when someone comes or goes, such as when your kids come home from school or play. Complete replacement smart locks will indicate what temperatures the lock is designed to withstand and often have an IP water/dust-proof rating; the insides of the lock housing are sensitive electronics, and not just metal pins, tumblers, gears and other mechanics. The one caveat is that not all locks can stand up to adverse weather conditions over a number of years; a trustworthy manufacturer with a long record of testing for such conditions is the best purchase qualifier. Not all physical door locks are created equal. There are three standard lock quality designations established by the ANSI/BHMA (American National Standards Institute/Builders Hardware Manufacturers Association) for security against picking/bumping or other physical attacks, as well as the number of locks/unlocks: grade 1 — the strongest grade, usually reserved for commercial applications; grade 2 — the most common residential lock; and, grade 3 — usually a secondary lock to supplement a grade 1 or 2 lock. Most smart locks are ANSI grade 2. Given the publicity hackers get, worrying about wireless security is now, unfortunately, a thing. Most smart lock providers boast about their wireless security using all manner of confusing technical jargon and nomenclature. There is no "best" wireless security scheme for smart locks, but just how high a priority the topic is given by a manufacturer — and a little research on the security method deployed — should be part of your purchase consideration. The most hack-proof smart locks are keypad-enabled models that don't use Bluetooth or Wi-Fi as their primary entry method. Most smart locks can be integrated into an existing smart home environment — with Amazon Alexa, Google Home, Apple HomeKit, IFTTT (If This Then That), Z-Wave, ZigBee, Samsung SmartThings, et al. — so checking or locking doors can be integrated into smart routines along with your lights, temperature controls, etc., but few are compatible with all smart home technologies. An increasing number of locks with Amazon and HomeKit compatibility also provide Alexa and Siri voice control, but usually only for locking the door when you're inside your home. Amazon recently approved an unlock voice control protocol that requires the user to provide a spoken PIN code after a spoken unlock command. A growing number of lock makers, including August, Kwikset (Kevo) and Schlage, are just beginning to implement this new Alexa Key "speak to unlock" feature. Traditional lock vendors such as Yale and Schlage offer a wide variety of hardware finishes and trims — variations of silver, bronze, brass and black — and even matching latch mechanisms. 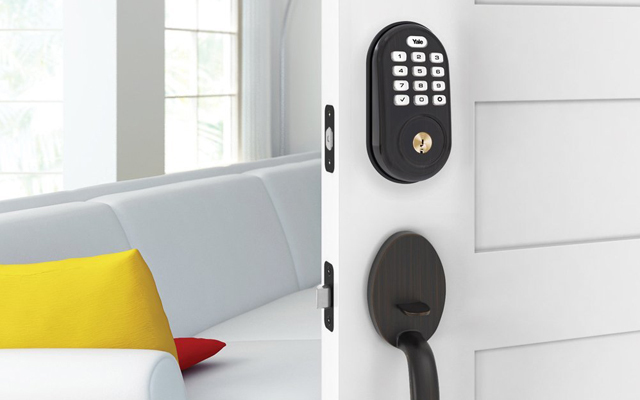 Newer tech-focused smart lock providers offer fewer aesthetic options. One size doesn't fit all when it comes to smart locks. Depending on which of the above features are the most important, who is using the smart lock and where you are stalling the smart lock, you'll want the smart lock that's best suited for your needs. Here are our top picks for the best smart locks. 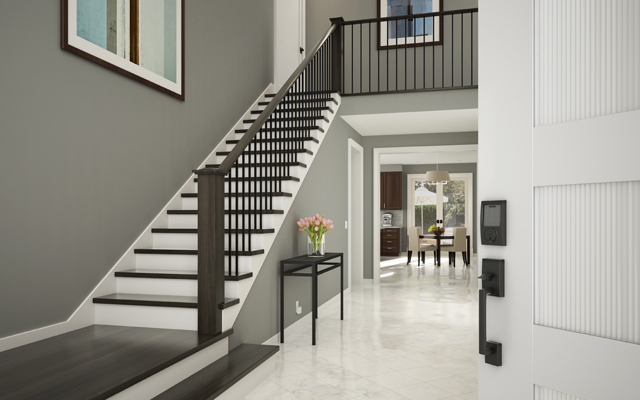 Not only does the Schlage Sense come from a long-established, well-respected lock brand, but it's one of only two ANSI grade 1 smart locks extant (the other is the less advanced Schlage Connect). It can be unlocked with a regular key, a PIN code, Alexa or Google Assistant voice command or remotely (with Schlage Sense Wi-Fi adapter, $69.99, check price on Amazon). There are a built-in motion detector and a customizable built-in alarm to let you know if someone is attempting an unlawful entry; it comes in a wide variety of trims and finishes to satisfy the fussiest of shoppers. Oh, "Schlage" is pronounced with a long "a" — it rhymes with "shade." Admittedly the whole touch-to-lock/unlock business seems rather insecure — you do need to have your phone on your person, but physically touching the lock as opposed to it automatically unlocking when you're merely in the vicinity makes a huge psychological difference. Not only does it work more reliably than Bluetooth proximity auto-unlock (and we found the first-generation version quite reliable), but it's faster than any other unlocking method and a blessing when your arms are laden with bags and bundles. There's also a key fob for family members sans smartphone, and you can always stick with a key if you're concerned about security. Plus, the Kevo (and this is a second-generation model) is made by Kwikset, a long-time, well-respected lock maker. Main drawback: You need to be comfortable with the security of a lock you only have to touch to open. From possibly the best-known smart lock maker, this basic retrofit lock is one of the least-expensive models available. It installs in minutes on the inside of your door, automatically unlocks when it detects your smartphone presence and auto-locks behind you. Inside the door, it looks and works like a regular thumb-turn bolt instead of a fancy gadget. August also includes simple-to-install DoorSense sensors that let you know the precise open/closed, unlocked/locked condition of your door. If you want more flexible functionality, you can add a keypad ($79 on August.com, check price on Amazon) for PIN code entry, an August Connect Wi-Fi adapter ($79 on August.com, check price on Amazon) for remote control, compatibility with Amazon Alexa — with voice control — and Google Home, or a Doorbell Cam Pro ($199 on August.com, check price on Amazon). You also can buy an August-branded replacement deadbolt lock ($39 on August.com). Primary selling point: Two terminals underneath the lock enable a 9-volt battery connection in case your lock loses power. Assure lives up to its name. Not only does it come from Yale, arguably the best-known and most trusted lock brand in the U.S., the Assure also eliminates most worries a smart lock introduces to your psyche. Assure is designed to look and act like a standard Yale lock, but also adds Bluetooth app control, timed PIN code sharing and user tracking capabilities. And if Assure's battery dies — no big deal. You can still use your physical key, or connect a 9-volt battery to the bottom of the lock to provide power for the keypad. If you want to later add smart home compatibility and remote access/control capabilities, you can add a Z-Wave, ZigBee or Apple HomeKit module ($50) that easily installs behind the battery pack. And if you want to remove the potential for picking/bumping, you can opt for the YRD446, which has no physical key hole — just a keypad. Have a room inside your home where you store valuables or weapons, or that you simply want to keep additionally secure? 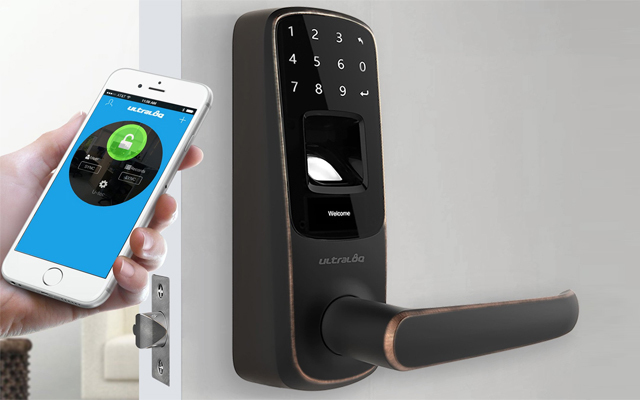 The Ultraloq UL3 BT is the only smart lock (so far) with a fingerprint reader for access, along with a touchscreen keypad and a hidden physical keyhole. Plus, you can simply knock four times on your smartphone screen to unlock it, and if the Ultraloq app is installed on an Android phone, just shake your phone to unlock it — you don't even need to have the app booted. For a more secure front door fingerprint option, Ultraloq will start selling its two-piece UL1 + AutoBolt fingerprint latch plus smart bolt lock combo ($239) in August 2018. Main drawback: Ultraloq is a latch lock, not a bolt lock, so it may not be appropriate for your primary front door lock. Many smart locks are compatible with separate door cameras, which adds the convenience of seeing who's at your door when you're not at home and enabling remote entry. While this pairing increases remote flexibility it adds a level of difficulty in terms of installation and reliable operation. Gate removes these potential operation barriers by cleverly building in a 720p door cam with a 150-degree field of view and two-way audio mic/speaker right into its new lock and combining their remote operation into a single app. Main drawback: Battery life is only 90 days. Primary Selling Point: Voice and "twist-assist" touch-to-lock/unlock for those with motor skill limitations; one of the smallest smart locks available. Seniors often have trouble adapting to new technology, which is what makes this simple retrofit model the perfect smart lock for those wishing to more gracefully age-in-place. You can still use your old key, and it still looks like a traditional thumb-turn bolt on the inside. But for those with arthritis, rheumatism or other muscular hand issues, the Danalock removes all key fumbling. It will unlock automatically when approached and auto lock when you leave, the inside bolt finishes unlocking or locking after just a slight manual twist, and can be operated either by Amazon Alexa or Apple Siri voice commands. An optional keypad ($99) is coming in early August, and a key fob will be available by the end of the year. Main drawbacks: Different versions for Apple HomeKit, Zigbee and Z-Wave; no Wi-Fi yet. The biggest pain for Airbnb hosts — other than cleaning up after messy guests — is arranging for key handoffs. A smart lock that lets you email timed keys is a decent solution. But the folks at Igloohome arranged with Airbnb to automate the whole PIN code process (Airbnb Connect is free): The code for Igloohome's smart lock products, including this new 2S smart lock due to go on sale any minute now, is automatically generated and delivered via email one hour before your guest's check-in date, only activates at check-in time and expires upon checkout. You don't have to be involved at all — other than that annoying cleanup. For your own added security, you can enter some random digits before your 7–9 digit PIN to foil a thief's attempt to figure out your code by checking for fingerprints. Great article and good pics. My comment is this: Many of the pics you posted reveal only one side of the lock—-in other words your article does not include pics of each brand’s escutcheon mounted on the inside of the door. I mention this simply because most apartments as well as other multi-family units already have a “keyless deadbolt” mounted in the space required by the locks you recommend. Bottom line: These locks will not physically fit on most apartment doors. Got the recommended August Smart lock… It’s seriously glitchy, especially with Android phones. The auto-lock unlock feature only works about 5% of the time. It often fails to connect so you can be standing outside your door for a good 15 minutes trying to unlock unlock it via your phone app, which makes it way less convenient than the conventional key. I’ve read reviews that say the keypad you can buy separately is also glitchy and will drain your battery within two weeks if you leave the Bluetooth on for auto unlock “capability.” Might as well save yourselves some money and go with a not smart keypad in the first place.